Every year, WHOA participates in the Combined Federal Campaign (CFC), the world’s largest and most successful workplace giving campaign. Established in 1961 by President John F. Kennedy, its mission is to provide federal employees with an opportunity to better their communities by contributing to causes they care about. The Federal Government’s Office of Personnel and Management (OPM) vets all 501©3 non-profits and organizes on site events where federal employees can meet charities first hand. In Los Angeles County, approximately 2,000 charities participate in CFC. We work very hard to carry the message to as many people as possible about what we do and the challenges our wounded vets face. What seems to resonate with federal employees is our hands on approach and focus on the entire family. If you’re a federal employee, please pass along our information and our CFC number to any friend or family member who participates in the Combined Federal Campaign and wishes to show their support for our Wounded Veterans. Thank you for your support. Mike and Wendy have been busy all over Southern California speaking to Federal employees. So far we’ve been to the Security and Exchange Commission, the Federal Air Marshals, the San Diego VA, the Long Beach VA, the LA Air Force Base, FAA, FBI, Custom and Border Protection and the Social Security Administration several times. So you can say we are off to a very busy start on our seventh year participating in the CFC campaigns. The campaign season runs from September 1st to December 15th. 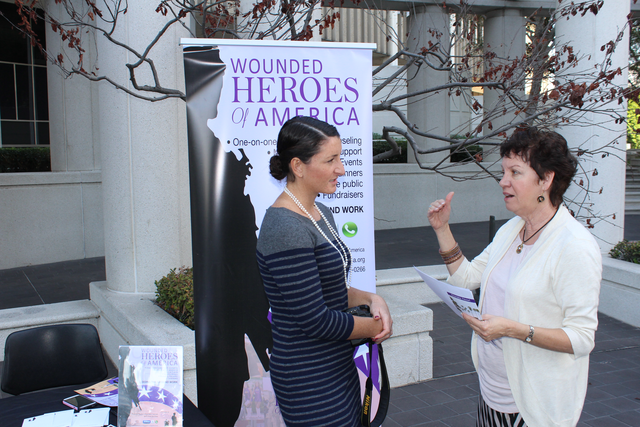 Any federal employee irrespective of where they work can now choose Wounded Heroes of America for a donation through CFC and payroll deduction. Please pass our CFC #99918 along to any family and friend in the federal employee community who may participate in the Combined Federal Campaign. Thank you for your support!